For the present time, the ship is sailing towards Cape Town. She should arrive around end of this month. The SA Agulhas is a South African, ice-strengthened polar research/supply vessel that was built by Mitsubishi Heavy Industries in Japan in 1977. 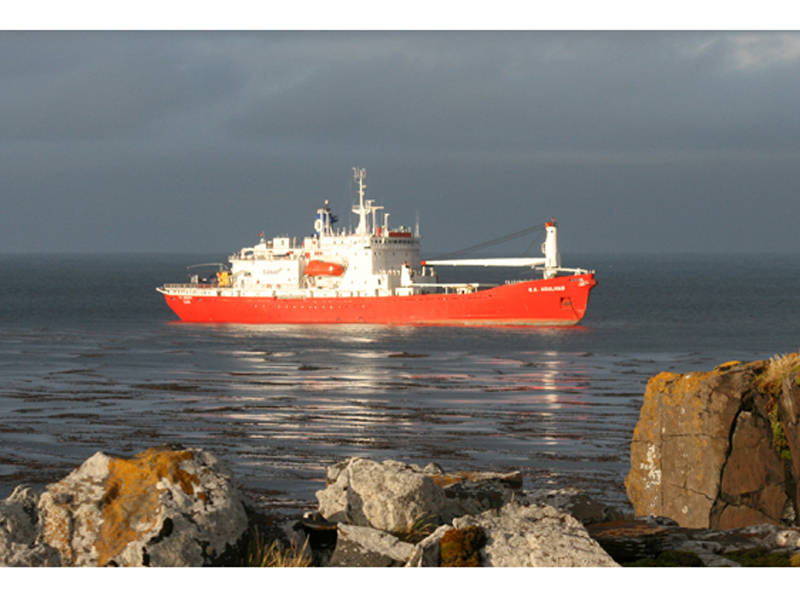 For over 30 years the ship has been used to service three South African research bases, on Marion Island, Gough Island and the Antarctic base SANAE IV. SA Agulhas weighs 6,123 tonnes and an overall length of 112 meters (367 feet). She is powered by two Mirrlees turbo-charged, intercooled, 6-cylinder, 4-stroke engines developing a total of 6,000 horsepower. She can cruise at 12.5 knots and has a range of 15,000 nautical miles and an endurance of up to 90 days at sea. For more information about the boat and her schedule, please visit the expedition website.